I've mentioned before that I've been in the stitching doldrums lately, but I did manage to get in a few stitches on my Garnet Purse. I had this grand idea that I would finish it in time to take it on vacation over the Fourth of July holiday, but you can see that that idea got nowhere. I worked on this last Sunday, and decided to take it with me in the car when it was my carpooler's turn to drive. These leaves are made using three strands of floss, unusual in that most of the embroidery in worked in perlé cotton. These leaves are made with buttonhole stitch, which I didn't think I would like at first, but realized that they came out looking quite nice. I also managed a bit of progress on some of the flowers. Tomorrow morning we head out to Colorado to see the granddaughter (and her mom and dad), and I'm bringing this with me, hoping to make some progress on it in the car. There have been terrible wildfires in Colorado lately, but luckily the weather has cooled into the 90's so that's helping. So you won't see too many posts until I return in just over a week. Have a great week! I realize I haven't posted very much lately, and I apologize. It seems I'm in the summer doldrums two months early. so thanks to all of you for being patient with me. I do have a finish to reveal, a black and white cat on a black and white quilt. Oscar graciously agreed to pose sitting on my son's new quilt. I started this six years ago, but most of the blocks have been sitting in my sewing room, waiting to be turned into a useful quilt. If you follow this link, you'll see that I last posted on this in October, 2010. Here you can get a good idea of the pattern, just a simple diagonal stripe. There are only two different blocks in this quilt, a black/white and a black/grey. I took this quilt top to a lady nearby who does long arm quilting, and together we picked out a not-to-feminine swirly quilt pattern, done in a black and white variegated thread. A slightly longer shot shows the pattern nicely. I've decided that I will never, never, never quilt another quilt again. This was so easy and relatively inexpensive (about $150) for the effort involved. I don't have a long arm machine, and after having this quilted, I don't ever want to learn how to do it, even on a rental basis. I chose a simple geometric black and white fabric for the backing. The quilt pattern doesn't show up on this at all, does it? Not that I'm all that experienced a quilter, but I do like to do something a bit unusual for the borders. In this one, I added a narrow gold strip for some "pop", then pieced slightly wider grey strips together for the rest of the border. It seems to give a bit of movement to what is essentially a somewhat dull looking quilt. I ran out of the gold fabric I used for the centers of the log cabin blocks, but managed to find something similar for the border. No more black and white for me, I like a bit of color in my quilts. I am so glad this thing is finished. I don't plan on doing much quilting in the future, although somewhere in the house there is a lovely blue/cream quilt-in-process that is partially cut out and almost not at all pieced. Now I can get back to something a bit more colorful in my various embroidery projects. I hope all of you have a great weekend and can manage to get some stitching time in! Today I am showing you some of the steps in creating one of the simple flowers in the Bits of Bullions Bubble. This is not by any means a tutorial, but I can give you some tips of what not to do. This is a Spiral Rose done in two shades of pink, the darker of the two, DMC 899, shown here as three strands in a No. 5 Milliner's needle. This is going to be a coil, so the entry and exit of the bullion are quite close together, only 2 mm apart. The center of the rose needs 25 wraps. Note how loose and uneven they are? Don't do this! I unwrapped and rewound the thread three times before I got it somewhat even. See the thread hanging down from the needle? The strands are a bit twisted, which will make lumps in the finished bullion. You want to get them nice and even, laying beside each other as you wrap the thread around the needle. This is a somewhat slow process, as you need to untwist the thread to make is lay properly on the needle, and move the growing kink further on down the excess length of floss. It really helps to have a good, long length of floss here, 25 inches or more. Finished center, not too shabby, but it really needs to be tacked down. For this the fabric needs to be in a hoop, and the loop tacked down in two or three places with a single strand of the same color floss. It's really important when tacking to follow the slant of the floss in the bullion, so the tacking thread blends in well with the bullion. The lighter pink, DMC 776, is used for the outer petals in a 30 - 35 wrap bullion. The start and stop are farther apart, so it will have some overlap when finished. I was concentrating so much on this flower that I forgot to take many of the photos. Here is the finished rose with a few fat leaves nestled underneath. The lighter pink could be overlapped a bit more. Even the leaves need to be tacked down so the loop will stay in the correct position. So for this one flower, I put it into the hoop three times for tacking. The main lesson here: These are not easy! It is a challenge to make a bullion with up to 35 wraps, all the while keeping them even and loose enough to slide off the needle easily. I've found that when making a design with more than one bullion that needs to be tacked, I will finish each bullion, put the fabric in a hoop and tack it down, then take out the fabric and proceed on to the next segment. The only exception is that I made both leaves before putting them into the hoop. It's a somewhat long and arduous process, but produces much better results than waiting until all the bullions are made to tack them. There is too much opportunity to get the twist of the bullion out of whack and going the wrong way. Trust me, I know. I've taken out almost as many bullions as I've left in. Next up, an ant and a spider! Isn't this the cutest little guy you have ever seen? Well, it's a new Trish Burr online class, and I've signed up to take it starting in September. If you remember, I took her first online class, the Chinese Flower and absolutely loved it. Her instruction were extremely clear, the class materials packaged and printed beautifully, and her critiques honest and helpful. I definitely recommend taking an online class from her, as it is rather hard to get to South Africa or to Beating Around the Bush every 2-3 years to take classes from her in person. I was wondering what a real Little Bee Eater actually looks like, so I searched and found the Wikipedia entry here. Trish's bird is a bit chubbier than the photos, but that may be the South African version. But other than that, Trish's rendering of the bird is just amazingly accurate. 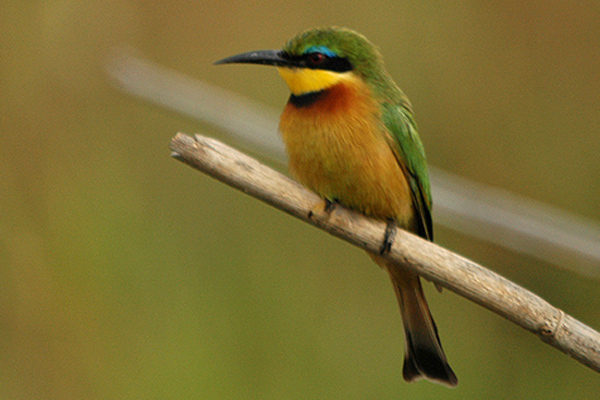 This is the photo from the Wikipedia article of a bird in Entebbe, Uganda. 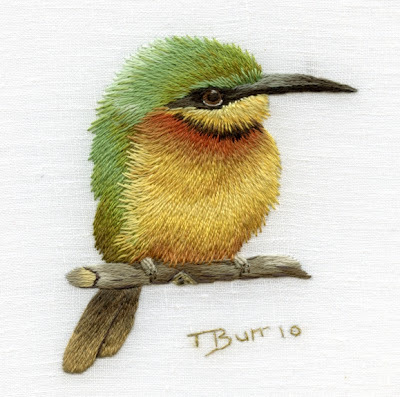 Beautiful, isn't it?Although I think Trish's rendering of him has a bit more of an attitude, don't you agree? I will keep all of you posted on this project. I have the class notes and will receive the materials in the mail sometime this summer.